Efficiency is a critical aspect of your business. You try to find ways to do things better, faster, and with less expense, so as to provide better service to your clients. But that’s not the only benefit to being efficient. Probably one of the more overlooked beneficiaries of efficiency is your ability to focus. Being efficient in what you do, especially the smaller-but-necessary tasks that occupy the periphery of your more important tasks, means you’re able to focus more attention on the primary task at hand. This focus receives its own exponential boost the longer you’re able to do it without distraction. Since computers are our primary means of accomplishing most of the tasks we perform in the modern law firm, having tools that allow us quick access to our productivity software and services is essential. Maintaining focus on our tasks means that those access tools need to stay out of the way. 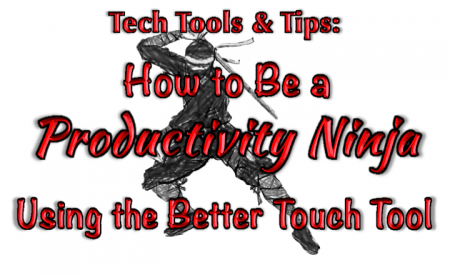 The Better Touch Tool allows you to dramatically improve your efficiency numerous ways. Keyboard shortcuts can be hard to remember, and can require using a complicated combination that slows you down while you’re working. Better Touch Tool lets you set up gestures that you are able to quickly execute on your trackpad for key shortcuts, ensuring you’ll never have to remember funky combinations or execute finger snapping or head-scratching combinations for functions you use regularly. Better Touch Tool has a number of pre-set options that you can use to access those keys based on a trackpad gesture instead. Also, there are several shortcuts that require the use of keys you may not have available to you. So set up the entire shortcut on Better Touch Tool instead of getting frustrated with alternate options. One of the most frustrating aspects of multiple monitor setups is the constant adjustment of window sizes and placements, particularly when you’re in a position where you’re using two monitors of slightly different size. Whenever l plug my laptop into my desk monitor, my laptop becomes my de facto second monitor, and Windows that fit nicely onto one screen are way too big or small when moved to the other. Better Touch Tool’s window control gestures, combined with Better Touch Tool’s window snapping tools, really make management of these screens simple and efficient. Simple: either you can click and drag every window to be the desired size, or you can use the imperfect “whole screen” and minimize options. Neither of these options allow you to set your screen to a visible size that is less than the entire screen. Better Touch Tool has a number of pre-set options including maximize, maximize to half, maximize to one third, maximize to one corner, and a couple different options for minimizing. Efficient: once you’ve started using gestures to do things like shift a window from one screen to another or maximizing it to a particular size, you’ll find that using any other method forces you to actually stop what you’re doing and adjust the screen, reducing your focus and taking up mo of your time. 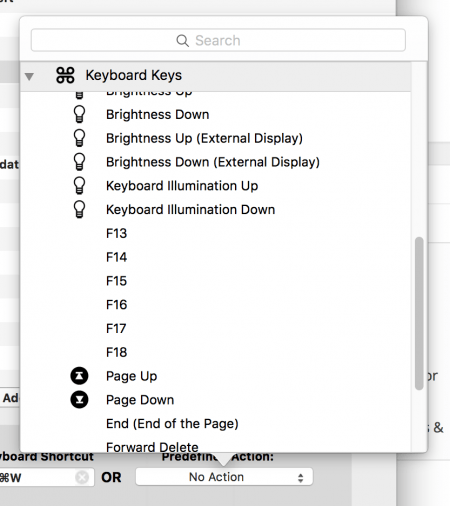 While replacing some of your most-used keyboard shortcuts, there are plenty of menu options that do not have (and cannot be given) a keyboard shortcut. However, many of these options, particularly within individual apps, can be some of your most used functions. Better Touch Tool’s menu option tool allows you to designate a certain path of menu commands, similar to a macro, for any particular gesture. One of the ways that Better Touch Tool helps you be more efficient is through the option to make your gestures generally applicable (always active), or application specific. There are some tools that you want to be applicable to every (or nearly every) application, and make sense for that particular use. 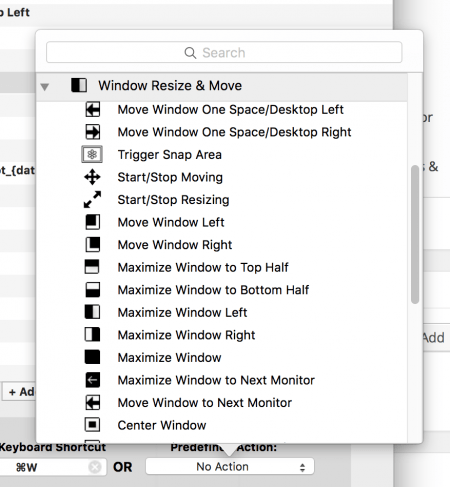 For example, you wouldn’t want your window resizing or movement options to only apply to one type of window, that would probably be confusing and make you less efficient. Better Touch Tool allows you to set shortcuts to apply Generally – as in applicable to every application – in your preferences screen. On the other hand, you might have shortcuts that only make sense in one particular application, and having it functioning in other apps could be inefficient or even damaging. This problem is particularly acute when your shortcut for one program, when used in another program, executes a completely different function. 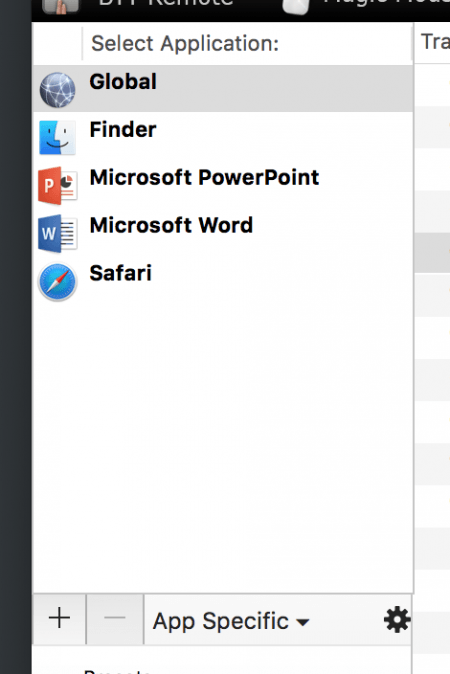 Example: In the video, I show one of my functions for PowerPoint – it triggers the File menu, then the 9th item down on the File list (in PowerPoint, that item is “Save as Picture…”). However, in OneNote, the 9th item down is “Close This Notebook,” which has an entirely different effect on my ability to continue working. Solution #1: Only create a couple General Shortcuts, and do most of your work in creations for individual apps. 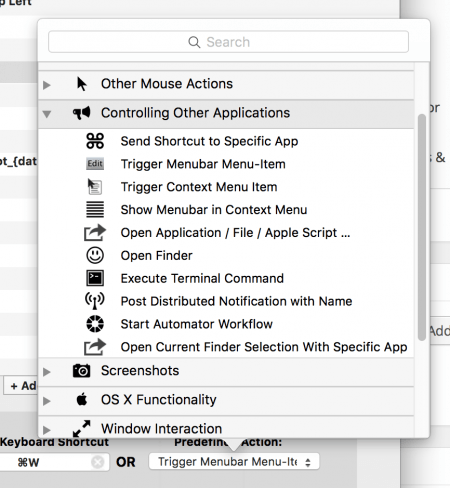 The benefit to this approach is that you’ll never have to worry about your General Shortcuts from interfering with your unique, application-specific ones. The major drawback to this approach is that it will necessarily result in creating a lot more shortcuts, and it will be more difficult to consolidate them into more general shortcuts should you choose to do so down the road. This approach is best for users who only want to create a few gestures, using Better Touch Tool only for the most important, time-saving shortcuts. There is nothing wrong with this approach, because Better Touch Tool can save you a ton of time regardless how you use it. More importantly, it’ll only really be an effective time saver if you’re invested in doing it and comfortable using your shortcuts. If you think you’lre only going to customize a few key shortcuts, use this approach. Solution #2: The “No Action” approach. This approach is geared more towards power users. You create a TON of General Shortcuts, the ones that are applicable in most – if not all – applications. However, where a shortcut has uses in some apps but not others, instead of taking it out of your General Shortcuts, you create that shortcut again in the apps that you don’t want the shortcut to apply, and use the “No Action” result. The benefit to this approach is that you’ll be able to create a ton of quality shortcuts right in your General category, reserving the truly unique app shortcuts for the specific apps themselves. It’ll keep your shortcut list much more organized and easy to modify, which will be crucial because – as a power user – you’ve got a lot of shortcuts. The drawback, as is probably pretty obvious, is that every shortcut you don’t want to run in a particular app will have to receive the “No Action” treatment. Given that certain types of apps have very unique menu structures, this can result in quite a lot of apps being added to your Better Touch Tool list solely to have the “No Action” triggers added. That can become a bit of an organizational headache in and of itself. Moreover, if you have to give that particular gesture the “No Action” treatment in a particular app, that gesture is unavailable within that app. This approach will take a lot of work to set up and keep organized, but it is probably going to be the best approach for anyone who really wants to get a lot out of Better Touch Tool through using a lot of different shortcuts. The great news is that there’s no right answer! This program is such an amazing time-saver, and is so wonderfully customizable that basically any type of user will find some worthwhile benefit to using it. Currently, Better Touch Tool is available for a 45-day trial period, after which you can purchase a license by donating a few bucks to the developer. The great trick the developer uses? After 45 days, there’s no way you’ll want to live without the shortcuts you’ll have gotten so used to. If you use Better Touch Tool, share your favorite recipes in the comments section! 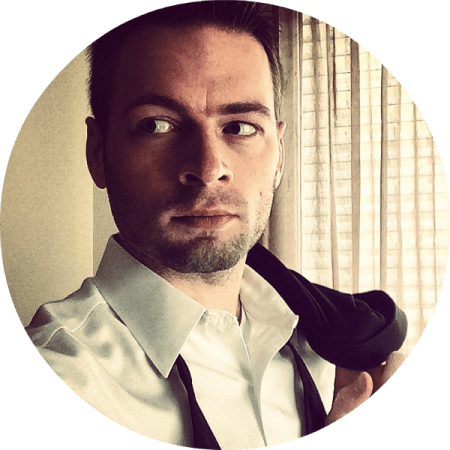 Brian Focht is a civil litigation attorney and technology enthusiast. In addition to being the author of The Cyber Advocate, he is also the producer and host of the Legal Technology Review podcast, and co-founder of B&R Concepts, a small business technology consulting company.